InfoPath forms can be deployed to a Sharepoint document library, and assuming that the form template has been developed to be browser compatible, the form can be opened in a browser client (either when the user’s machine doesn’t have the InfoPath client or when the Sharepoint document library is configured to open forms by browser only). Such form templates can usually be published directly to a Sharepoint document library without Administrator intervention, however, when the form template contains managed code the form cannot be published directly to the Sharepoint document library, but has to be first Approved by the Sharepoint Administrator. 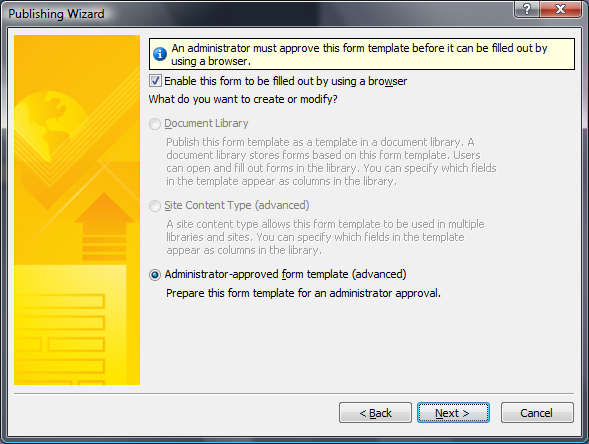 The Administrator has to approve the template, upload it and then activate it against 1 or more site collections. Continue the publish procedure as normal, except that you will be publishing to a network share (or other location) accessible to the Sharepoint Administrator who can then review the form template and approve it. Select Application Management, from there select InfoPath Forms Services, and then choose Manage Form Templates. The Form Template library is opened, which is where administrator approved templates for the farm are stored. Select “Upload Form Template”. Locate and select the saved template file and click the Verify button. You will be shown any errors or warnings related to your template (review them if necessary), and click OK. Locate your form template again. The Upgrade options exist for you to choose how to upgrade the form template if it already exists. Click the Upload button to perform the form template upload. It is now available as a Feature to be activated against any site collection in the farm. You can activate the form template feature from the Manage Form Templates page of Central Administration, the same page where we just uploaded the template. From the templates context menu, choose Activate to a Site Collection. In the Location section of the page, choose the relevant Site Collection and click the OK button. Note, that you may have to change the Web Application location in order to find the right site collection. From the Content Types section, select “Add from existing site content types”, from the list box displayed locate your form template, click Add then click OK. If you return to your form library and select New from the library menu, you should see an option there for your form template. If you choose this new option, the form template should be opened in the browser. f. Modify the DCL’s in the production environment.